Picnickers frolic beneath the deadly sun in Auckland's beautiful Western Springs Park, one of nearly 500 places in the city where anyone can spend a day outdoors, beneath the hole in the ozone layer. Auckland is far more verdant than my old home. If I were to assign north Brooklyn a single particular color, it would have to be “WD-40.” Although I loved many aspects of my neighborhood there, Greenpoint didn’t deserve its name (although WD-40-point, while more accurate, wouldn’t roll off the tongue quite as well) since in the entire area there couldn’t have been more than eight trees, and those were all being converted into luxury condominiums. Not so Auckland where there is no luxury and where its citizens are positively up to their arses in chlorophyl. This metropolis is lousy with swards, copses, fens, strands, arbors and meadows, to say nothing of its tree-lined streets. Rush hour on Queen Street, Auckland's main thoroughfare. This new lush setting inspired Jacquie to make me make a new year’s resolution to visit every publicly owned parcel around. Boy, did we have our work cut out for us. Our sources had it that there are 481 green spaces within the city limits. That’s one park visit for every day of the year. We had a lot of speed-walking ahead of us. Incidentally, larger green spaces in Auckland have the word domain or park in their official names, but the difference between these designations is obscure to me. 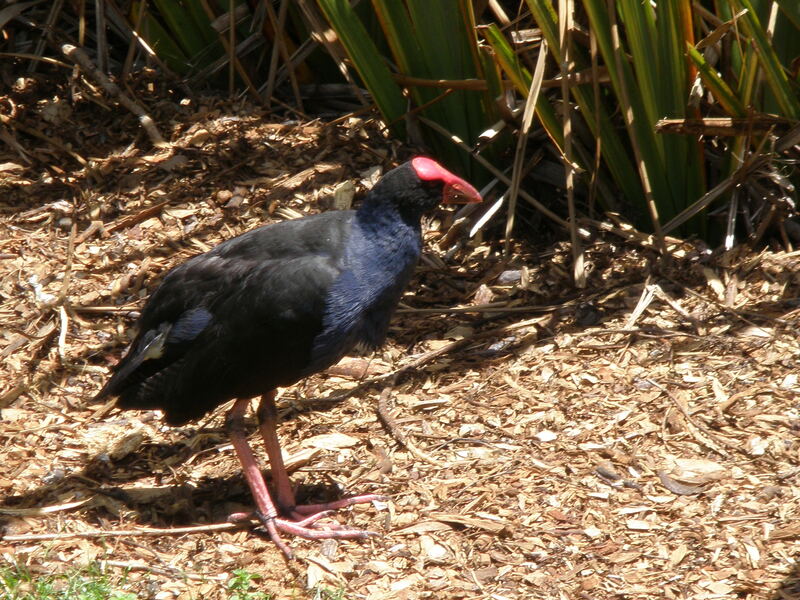 Perhaps there is none, but for whatever reason, modern Auckland has 16 Domains, 88 Parks and 337 sites called Reserves, smaller areas set aside for dog-runs, bowling lawns and potted-plants. 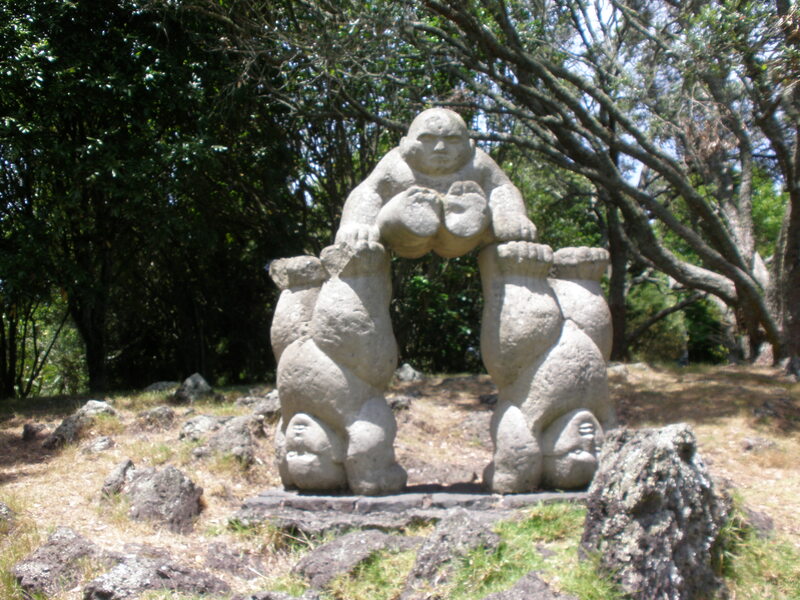 We decided to begin our new year’s resolution with a trip to Western Springs Park, home to the Auckland Zoo and the Museum of Transport and Technology (or MOTAT) an institution devoted to the preservation of ancient farm equipment and tetanus. 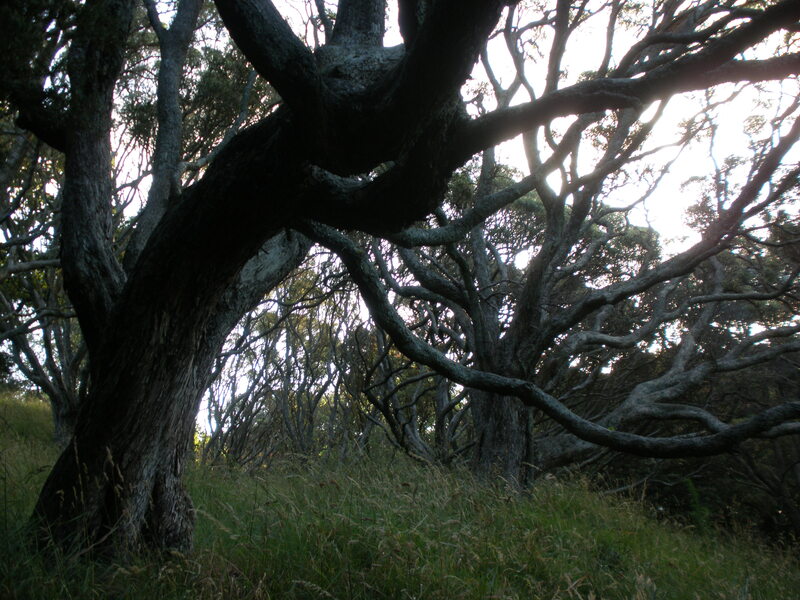 Western Springs offers lakeside strolls and shady paths under native pine trees and thrilling views of endangered animals and humans assailing one another in their timeless struggle over packed lunches. 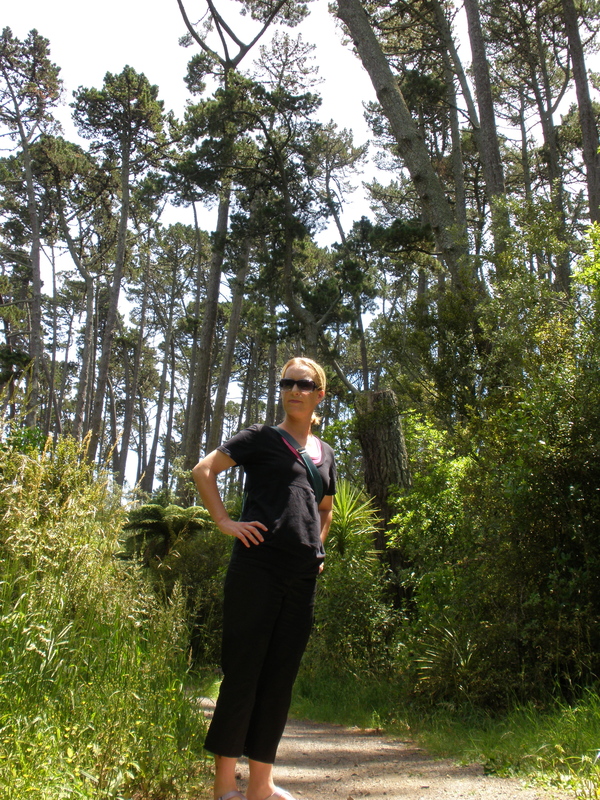 Jacquie and I saw plenty of stuff there that I’d never seen before, which New Zealanders seem to take for granted. A pensive dinosaur (Porphyrio porphyrio melanotus). It was a warm bright day and the sun shone down on us like a hole in the ozone layer gently tinkering with our melanin. “God, I wish we could spend our entire lives indoors,” I said. “Bed-ridden people are so lucky,” Jacquie said. We decided to continue our walk through the pines. Being a New Yorker, I reflexively grew wary of criminal activity. The shadow underneath the trees seemed to swallow our path in darkness, a common tactic for muggers. Sure enough, a man suddenly appeared before us, strolling aggressively in our direction. The mugger wore a shabby sweat jacket with shorts and sandals. He had long, greasy hair and it was obvious that he hadn’t shaved his legs in a very long time. “Let’s turn back,” I said. We presented our purses for our mugger to inspect, but he didn’t seem to notice them. “Beautiful day, isn’t it?” he said. “Enjoy,” he said. “Enjoy.” He continued on his way. After that close call, we weren’t going to take any more chances. We decided that we would scream for help every few minutes just in case. And if anybody else did approach us, we were supposed to run away in separate directions so that at least one of us could get on with our lives, which I truly hoped would be me. Secretly, I planned to kick Jacquie in the shin to gain the advantage and I mentally prepared myself for this eventuality. As it turned out, we didn’t see anyone else on the pine walk, but we did have an experience that changed our lives for 37 minutes. As we moved farther into the bush, we started to take pictures. That’s when I heard a cat meowing. The Pines Photo. Jacquie, still visibly shaken from our run-in with a mugger, ignores the pleading of a stranded cat (upper left). It then occurred to me that the meowing might be the ruse of another mugger to lure us off the path. I screamed for help, kicked Jacquie in the shin and ran away and, 3o meters down the path, just as I was starting to heal from my trauma, ready to move on with my life as a widower, I heard Jacquie calling my name. “It’s not a mugger,” she said. 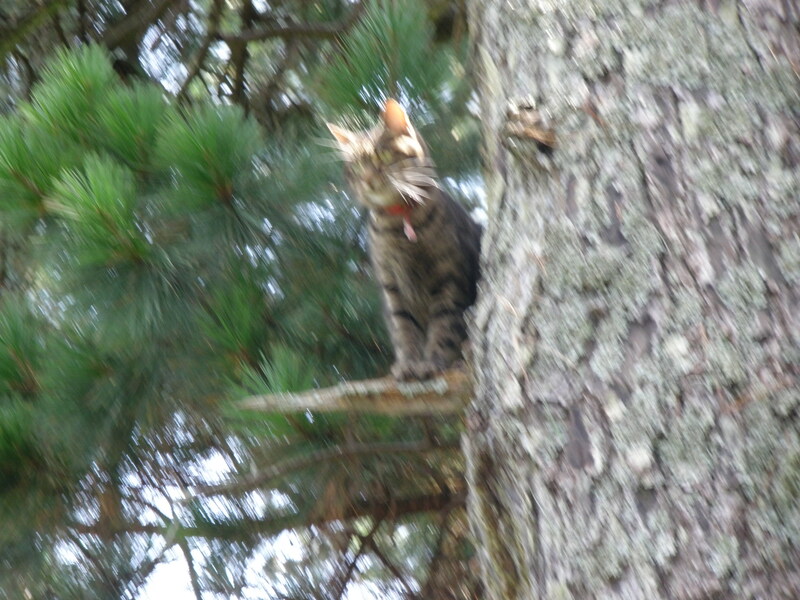 That’s when I saw it, stranded high up in a pine, 15 meters off the ground and meowing its little head off. There, clinging to its perch for dear life, was a blurry cat. We didn’t know what to do. It was too high up for us to reach and there weren’t any loose branches long enough to reach the poor fellow. That’s when I decided to call 911 (1-1-1 in New Zealand). Nobody picked up. So then we called the SPCA. The woman on the other end told us that they usually wait 24 hours to respond to such a call, just to be sure that the cat is sincere about wanting to come down from the tree. So we marched to the zoo and reported the stranded cat. Several people had already reported it, as it turned out. Jacquie and I were so relieved to hear that somebody else was taking care of this problem that we forgot about our mugging and went straight home to spend the rest of the day indoors, with the curtains drawn, watching videos. Mmm, send some of that deadly sun and green, leafy stuff my way. I’ll send you some exhaust and PM10 in return. That sounds like a fair exchange. But remember to reciprocate come June. A blurry cat? Are those native to New Zealand? Maybe it was a portkey to another dimension. Ha! You might be right .